The number one form of communication in corporate environments is email. Alone in 2015, the number of business emails sent and received per day were estimated to be over 112 billion  and employees spend on average 13 hours per week in their email inbox . Unfortunately, emails are at times also misused for illegitimate communication. Back in the days when the concept of email was designed, security was not the main focus of the inventors and some of the design short comings are still problematic today. The sender rarely uses encryption and the receiver cannot check the integrity of unprotected emails. Not even the metadata in the header of an email can be trusted as an attacker can easily forge this information. Even though many attempts have been made into securing email communication, there are still a lot of unsecured emails sent every day. This is one of the reasons why attackers still exploit weaknesses in email communication. In our experience, a lot of forensic investigations include an attacker either stealing/leaking information via email or an employee unintentionally opening Malware he received via email. Once this has happened, there is no way around a forensic investigation in order to answer key question such as who did what, when and how? Because many corporate environments use Microsoft Exchange as mailing system, we cover some basics on what kind of forensic artifacts the Microsoft Exchange environment provides. 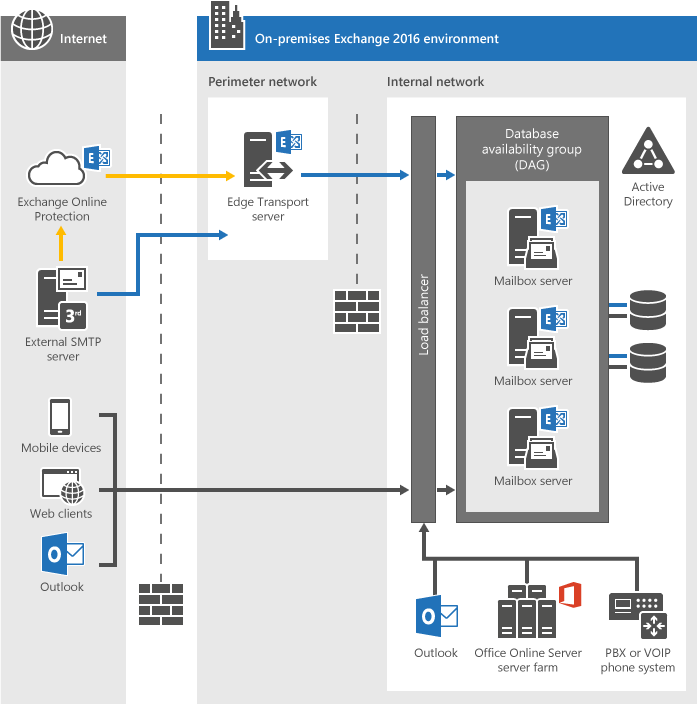 In order to understand the different artifacts we first take a look at the basic Microsoft Exchange architecture and the involved components. 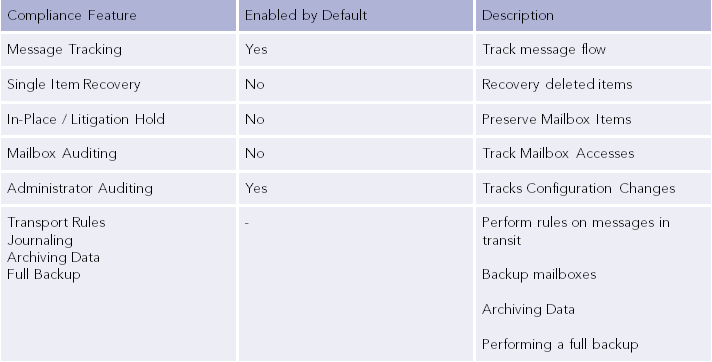 The diagram below this paragraph shows the architectural concepts in the On-premises version of Exchange 2016. Edge Transport Servers build the perimeter of the email infrastructure. They handle external email flow as well as apply antispam and email flow rules. Database availability groups (DAGs) form the heart of Microsoft’s Exchange environment. They contain a group of Mailbox servers and host a set of databases. The Mailbox servers contain the transport services that are used to route emails. They also contain the client access service, which is responsible for routing or proxying connections to the corresponding backend services on a Mailbox server. Clients don’t connect directly to the backend services. When a client sends an email through the Microsoft Exchange infrastructure, it always traverses at least one Mailbox server. Microsoft Exchange provides multiple compliance features. Each of those compliance features provides a different set of information to an investigator and it is important to have a basic understanding of their behavior in order to understand which feature can provide answer to which question. The most important compliance features are covered in the following paragraphs. The message tracking compliance feature writes a record of all activity as emails flow through Mailbox servers and Edge Transport servers into a log file. Those logs contain details regarding the sender, recipient, message subject, date and time. By default the message tracking logs are stored for a maximum of 30 days if the size of the log files does not grow bigger than 1000MB. The following example shows the message tracking log entries created when the user “alice@csnc.ch” sends a message with the MessageSubject “Meeting” to the user “bob@csnc.ch“. Note that in this example both users have their mailboxes on the same server. The source mailbox that needs to be searched. The target mailbox into which the emails will be recovered. Search criteria such as sender, recipient or keywords in the message. With the information above, an email can be found using the Exchange Management Shell (EMS) as shown in the following example. In-Place Hold can be used to preserve mailbox items. If this compliance feature is enabled, an email will be kept, even if it was purged by a user (deleted from the “Dumpster” folder). Also if an item is modified, a copy of the original version is retained. The In-Place hold is usually activated during investigations in order to preserve the Mailbox content of an individual. The individual do not notice that they are “on hold”. A query with parameters can be used to granularly define the scope of items to hold. By default In-Place Hold is disabled and if neither Single Item Recover nor the In-Place Hold is enabled, an email will be permanently deleted if a user purges (deletes) it from the “Dumpster. Mailboxes can contain sensitive information including personally identifiable information (PII). Therefore it is important that it gets tracked who logged on to a mailbox and which actions were taken. It is especially important to track access to mailboxes by users other than the mailbox owner, the so called delegates. By default mailbox auditing is disabled and when enabled it requires more space on the corresponding mailbox. If enabled, one can specify which user actions (for example, accessing, moving, or deleting a message) are logged per logon type (administrator, delegate user, or owner). Audit log entries also include further important information such as the client IP address, host name, and processes or clients used to access the mailbox. If the auditing policy is configured to only include key records such as sending or deleting items there is no noticeable impact in terms of storage and performance. This compliance feature is used to log changes that an administrator makes to the Exchange Server configuration. By default, the log files are enabled and kept for 90 days. Changes to the administrator auditing configuration are always logged. The log files are stored in a hidden dedicated mailbox which cannot be opened in Outlook or OWA. Journaling allows recording a copy of all email communications and sending it to a dedicated mailbox on an Exchange Server. Archiving on the other hand can be used to backup up data, removing it from its native environments and store a copy on another system. Finally there is always the option of a full backup of an Exchange database. This creates and stores a complete copy of the database file as well as transaction logs. If you are interested please visit our “Security Trainings” section to get more information: https://www.compass-security.com/services/security-trainings/kursinhalte-forensik-investigation/ or get in touch if you have questions. Just upgraded to CU 6 . Single Item Recovery is suposed to be able to restore items ( not folders ) back in their original location now. Sounds good , since this is a pain for many users , when they have deleted a bunch of items and need to drag them to their original location manually. Hope it works.